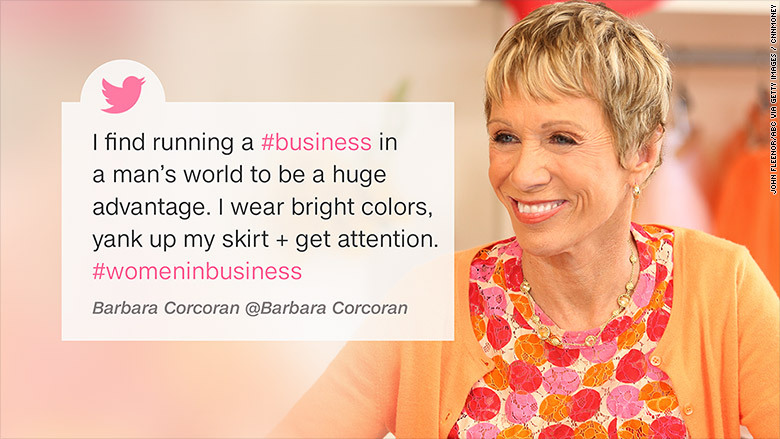 Real estate mogul Barbara Corcoran has some pretty outrageous advice for female founders in business dealings. "I wear bright colors, yank up my skirt + get attention," she tweeted on Tuesday. She said in the tweet that she finds that being a woman running a business in a man's world is a "huge advantage," and used the hashtag #womeninbusiness. Corcoran founded The Corcoran Group, a 35-year-old real estate group that operates in New York City, the Hamptons and South Florida and does $18 billion in sales annually. Corcoran, 67, is also an investor in startups like Pipcorn and Wanderu and is one of the "Sharks" on ABC's Shark Tank. Her website bills her as a business expert -- but her views don't jibe with those of many young female entrepreneurs today. Female founders often say that when meeting and pitching investors, they purposely dress in androgynous clothing. That means things like black blazers that look business professional. "We should be judged by our revenue and vision, not by what we wear," said Eileen Carey, cofounder of Glassbreakers, an entreprise software startup that's helping women find mentors within companies. Carey told CNNMoney that Corcoran's comments are the "opposite of progress." "We should be moving towards a place where gender is no longer a way to get attention -- or not get attention," she added. Corcoran's tactic can be problematic in the venture capital world, which is predominately made up of men. A 2015 study found that 92% of senior investment teams at top VC firms are male. "I think that this statement can be a double edged sword," said Polina Raygorodskaya, who founded the Corcoran-backed travel site Wanderu. "It is already difficult for women in male dominated industries to break through and be on an even playing field." Women often try to downplay their gender because their know that investors look for entrepreneurs who remind them of prior successes -- like the next Mark Zuckerberg. Silicon Valley's habit of "pattern matching" is something that both women and minority founders have said can hurt them, since there aren't a lot of women or minorities in tech who've reached Zuckerberg status -- yet. This isn't the first time that Corcoran -- who is known for her brash nature -- has shared some unconventional business tactics. A 2009 profile in Women's Wear Daily said that Corcoran had a a sales strategy the incorporated being "slightly inappropriate." That includes, according to the article, telling her brokers how attractive they were and physically touching them. "She's not hitting on you, she's selling you. It usually works," a former "underling" of Corcoran's is quoted as saying. Barbara Corcoran did not immediately respond to requests for comment.